As I had discussed in one of my previous articles on Men's formal dressing, not everyone is able to find a perfect fitting dress shirt/ formal shirt from the readymade sizes available. Every has a different measurement. When it comes to readymade formal shirts, there is always some compromise either on the style or on the comfort. The answer to this is tailor-made, custom-made or made-to-order shirts. But how many of these tailors who undertake custom stitching have the perfect fashion sense? 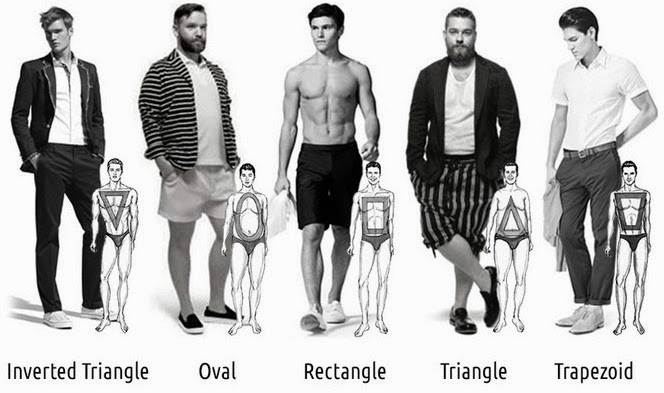 And how many would actually bother to suggest you what type of cloth you should get and what would actually suit your body frame? Do you really get full value for the money you spend on a great dress shirt you desire? I just came across this revolutionary project by Function and Form which I am going to share with you today. Their creativity and freshness has left me far beyond impressed and I am sure the new features they have incorporated in designing their Men's dress shirts will genuinely arouse admiration in you all too. 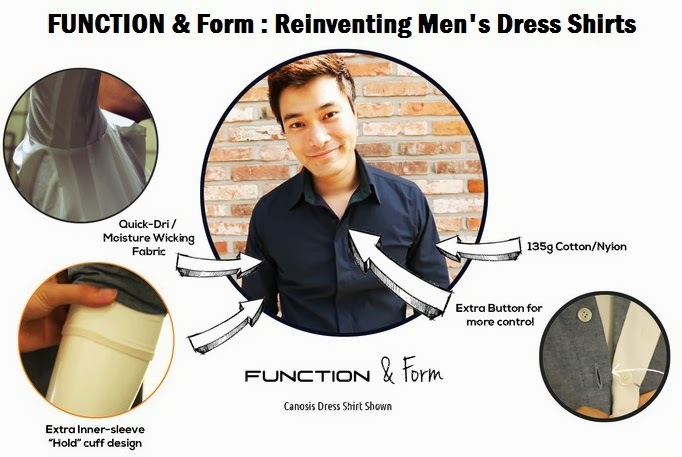 Function and Form has literally reinvented the men's formal dress shirt keeping it uber stylish yet making it super-comfortable like never before. If you work in a corporate environment where formal dressing is mandatory, you would understand how restrictive formal dress shirts can be at times. 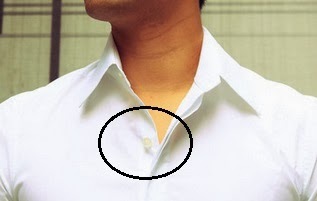 Most readymade dress shirts have very less gap between the buttons. So when you button it up, you might feel stuffy and uncomfortable. And if you button it down a little, it looks inappropriate and informal. This is especially true of men with a heavy upper body or a thick neck. If you are not under AC all the time or if your job involves moving around a lot, the sweating leaves embarrassing patches on your underarms. And in summers, even the back of the shirt clings to your skin due to the sweat. If you try to fold up the sleeves to get some comfort and air, the sleeves keep slipping down. 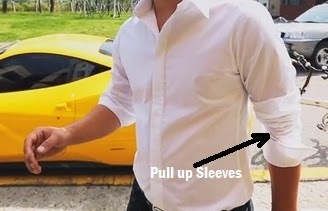 Not everybody knows how to fold up the sleeves neatly. The stitching on the inner side reveals and moreover it's rare that you will get both the arms folded to the same length :) Even though I am a woman, I understand this part very well because I like dressing up formally. Moreover, when you raise your arms, you feel restricted as the folded sleeves don't let you move your arms freely. Now let's see what FUNCTION & Form has done to tackle these problems and what makes their shirts unique. 1. Function and Form dress shirts come with an extra button on the neck opening for the perfect control - neither too stuffy, nor too revealing. 2. The arm-pits and the back of the shirt have special panels/ canosis lining made with innovative quick drying, cooling, moisture wicking fabrics. 3. The sleeves come with a 2.5" long extra inner-sleeves made of high quality stretchable cooling fabric. 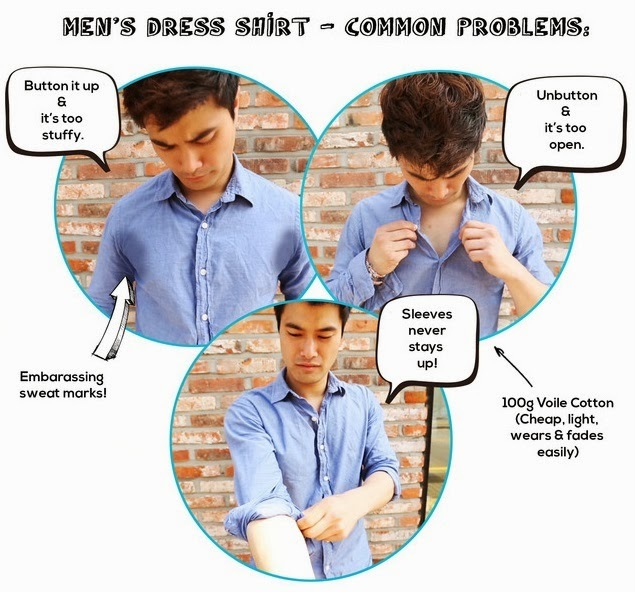 You no longer need to roll or fold-up the sleeves. The extra band on the inside lets you simply pull the sleeves up like you do with a sweatshirt or pullover sleeves. So there is absolutely no compromise on the comfort or the style. 4. Function and form uses pre-dyed woven fabric to reduce color fade. Brands like Zara, H&M, Forever 21 etc use 100g Voile Cotton, which is lightweight, but not durable. Luxury Premium dress shirt brands (like Hugo Boss, Zenga etc) use 120-140g cotton, but these cost $300 or more. Function and form provides you the same luxury premium quality (and ever higher), along with durability at 1/3rd the price or even less. Even though the shirt sizes are made in line with the North American size standards, you have the choice to get your shirt made as close to your perfect fit as possible. 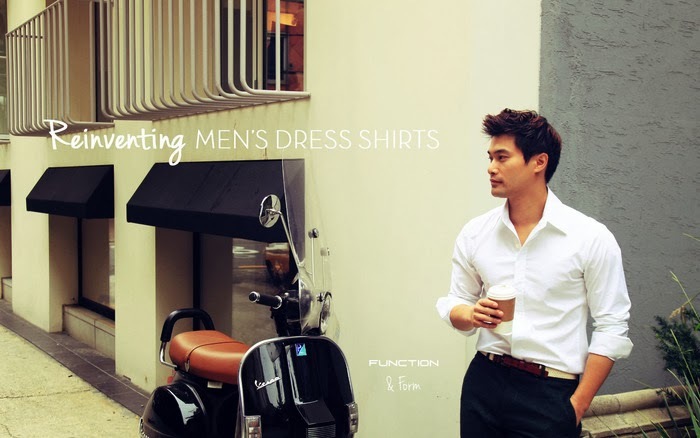 While ordering a custom-like dress shirt from Function & Form, you have the option to select your body shape and also send in your personal size measurements. Besides the shirts, they also have accessories and deep V-neck layer t-shirts. Function & Form LLC is a Charlottesville, VA, USA incorporated company founded by Sam Yang, Ryan (Jongchan) Lee and Chris Park. It's design and manufacturing facilities are based in Seoul, South Korea and Los Angeles, California, USA. This is Function & Form's first project and not everyone has the creativity and the guts to break through the traditional path and come up with something different yet functional. They have literally reinvented the men's formal dress shirt, proving that fashion can actually be comfortable too. But this dream and hard work needs support from all over the world before they can establish themselves as a brand and create more such functional clothing in the future. You can learn the full details about their project HERE. They need to make initial sales of $10,000 by Nov 25, 2013. If they reach this goal, they will receive funding for their project and will be able to create these shirts on a larger scale. To support their cause, you can pledge in an amount and back up their project. By doing so, you will be backing up their dream and will be (in a way) one of their initial buyers, helping them lay the foundation for this brand. In return, you will be rewarded a customized innovative new dress shirt (and the accessories) based on the rewards mentioned against each pledging category. For more details, see the pledging options on the right side of THIS page. If you know someone who would be interested in such an innovative high quality product, help spread the word. Note: The pictures belong to Function & Form and have been used with their permission. I do NOT own the pictures. 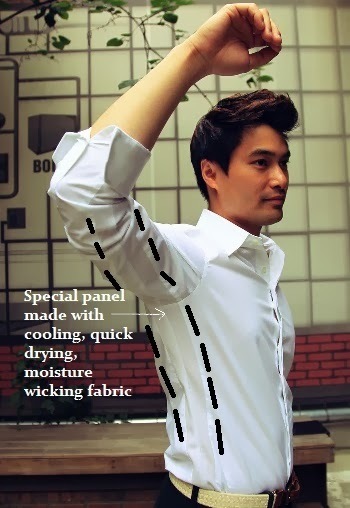 What's your opinion on these innovative functional formal shirts? Thanks for reading Tejinder. Isn't the concept great? Hope they reach the threshold amount soon! Yes quite creative and interesting, I agree. Even I pray they reach their target amount so this business can get funding. I saw their video on their site and the quality of their work is indeed impressive.